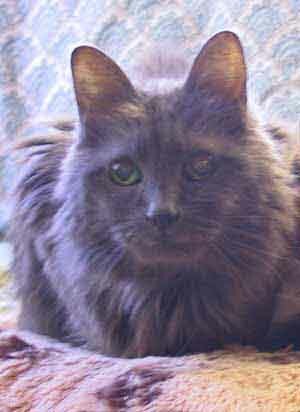 Here are a few pages about our cats and a few pages about cats with chronic, treatable conditions. Included is information about cats with CRF (chronic renal failure), cats with DI (diabetes insipidus), cats with DM (diabetes mellitus), cats with FIV and other conditions. There are stories about cats and even cats dispensing advice. We hope you enjoy them! Click here for Emma's very own birthday page. secrets of living with CRF. Dr. Kathy James research fund. Ever have a CRF cat? Or one that's constipated? Or just a sick cat? 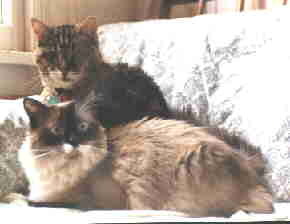 Puff, Ziggy and Simone are living with Diabetes Insipidus. 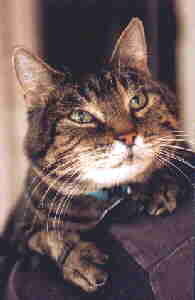 Ozzy (1982-2000), who was adopted at age 13, always recommended that adopters consider choosing older adult cats ... who might just turn out to be PURRFECT, just like Ozzy! Click here for Ozzy's page. Visit our picture gallery of some of our favorite feline friends. Are you ready for some spiritual enlightenment? Do you know how your cat really wants to be treated? Coming soon ... a page with other cat stories. Does your feline friend need advice? Do you understand what your cat is telling you? Clueless? Visit Amy and Alice's page. Although Alice retired in 1999, she has passed the torch to Amy, who has something to say about everything. You can ASK AMY anything. Here are a few of the questions Alice and Amy have fielded so far - See what they have to say. Click here to visit our Gallery of Christmas Past. We have two pages of pictures in the spirit of the Christmas season. If you have comments, please mail them to ME . All photos are copyrighted. Please ask before using for anything other than personal use. All written materials may be reprinted without permission as long as they are not changed. Please credit "SurroundedByCats.com" if used.